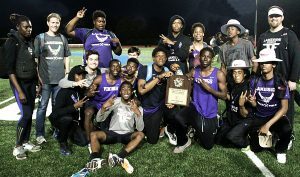 The Lakeside Vikings made sure they would not go 42 years between DCSD Track and Field Championships as they sealed back-to-back titles at the 2017 Championships 92-80 over Arabia Mountain. Arabia Mountain held a one-point lead of 46-45 coming out of the field events on Saturday and jumped out of the gate on Monday with a victory in the 4×100 meter relay in 41.32 by the team of Jordan Barrow, Priest Foust, Berhane Johnson and Tyler Jones. Super sophomore Brian Herron gave Lakeside a brief lead of 60-56 with his win in the 400 meter dash (47.80) following the relay. Herron’s time was just .82 off the record set by Eddie Miller of Southwest DeKalb in 1987. 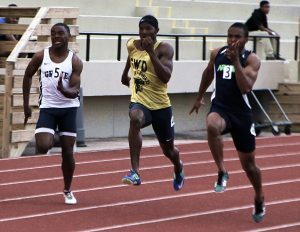 Foust would swing the lead back in favor of Arabia Mountain by winning the 100 meter dash (10.70) to make it 66-60 with the Rams in front. Myles Boyd picked up the first of two silver medals with his second place finish in the 800 meter run and Marvin Bellance was fifth as the pair added 12 points to the Vikings’ total to swing the lead back in favor of the Vikings at 72-66. Herron picked up his second gold of the night with a win in the 200 meter dash (21.20) and Arabia Mountain added 11 points to keep the standings tight. The Vikings held a 90-80 advantage with just the 4×400 meter relay remaining to clinch the title as the Rams had no entry in the final race of the day. Lakeside eased to a seventh place finish to pick a final two points and make the final tally of 92-80. The title gave the Vikings six overall to move into a tie with Redan which is good for fourth behind Southwest DeKalb (14), Chamblee (8) and Stephenson (7). Sam Ellis of Decatur swept the 800 (1:58.01) and 1600 (4:22.15) meter runs to take home a pair of golds for the Bulldogs. 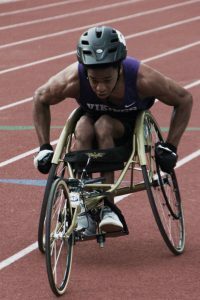 Justin Birdsong of Stephenson picked up the gold medal in the 110 meter hurdles with a time of 15.48 and the 300 meter hurdles title went to Fereday Chipere of Miller Grove in a time of 40.42. Southwest DeKalb won the 4×400 meter relay for the second year in a row with a time of 3:17.90 by the team of Marcellus Boykin, Devin Brewington, Terry Conwell and Terryon Conwell. Arabia Mountain picked up three gold medals in the field events on Saturday and held a slim 46-45 lead on Lakeside heading into the finals. Senior Tyler Jones picked up a gold medal sweep of the long jump (22-04.25) and triple jump (47-00.00) while Micheal Willingham took gold in the discus (172-06.00). Senior Gordon Lewis finished runner-up in the shot put (48-03.50) and discus (138-03.00) as the Vikings had four silver medals in the field events. Senior Mike Haug was second in the pole vault (10-06-00) and senior Zyon Robinson took the silver in the triple jump (43-00.25). Other winners included senior Ermias Tewolde of Druid Hills in the 3200-meter run (10:07.27), Martin Luther King junior Coleman White won the high jump (6-02.00), Chamblee senior Will West won the pole vault (12-00.00) and Decatur senior J. Robert Edge won the shot put (49-05.00).